Airton das Neves was born in 1964 in Sao Paulo, Brazil, where he currently lives and works. 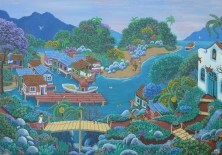 A self-taught artist, he began his artistic career in 2000. He worked as a salesman and an administration assistant.